Sunday October 27th 1895 It was cold windy day. It was so late when I got up that I was busy about the house most of the forenoon. We stayed right at home to rest. I read and wrote some. Monday October 28th 1895 I was busy all forenoon with the dinner and the work as I usually am. Will was helping the boys husk corn. I used spare time afternoon and evening on my red knit waist after doing a little mending. 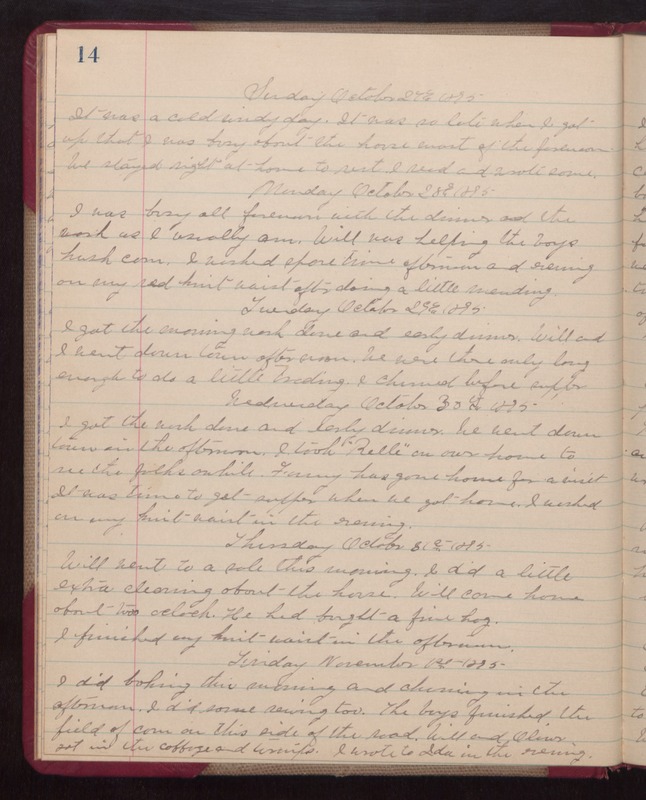 Tuesday October 29th 1895 I got the morning wash done and early dinner. Will and I went down town afternoon. We were there only long enough to do a little trading. I churned before supper. Wednesday October 30th 1895 I got the work done and early dinner. We went down town in the afternoon. I took "Relle" on over home to see the folks awhile. Fanny has gone home for a visit. It was time to get supper when we got home. I worked on my knit waist in the evening. Thursday October 31st 1895. Will went to a sale this morning. I did a little extra cleaning about the house. Will came home about two oclock. He had bought a fine hog. I finished my knit waist in the afternoon. Friday November 1st 1895 I did baking this morning and cleaning in the afternoon. I did some sewing too. The boys finished the field of corn on this side of the road. Will and Oliver got in the cabbage and turnips. I wrote to Ida in the evening.